The evolution of Karate is shrouded in mystery and its exact origins have never been established with any degree of certainty. It is, however, known through archaeological discoveries and historical documents, that methods of unarmed combat have been practised for thousands of years. Perhaps one of the most significant archaeological discoveries occurred in 1839 when the British Antiquarian and Diplomat, Sir Austen Layard, uncovered during excavations of Mesopotamia (now Iraq), a buried library belonging to King Assurbanipal of the Assyrian Empire (668 – 626 BC.). A substantial amount of carved tablets were recovered from the site over a number of years which included one depicting the Epic of Gilgamesh. Gilgamesh was the King of Urak in Babylonia in about 2500 BC. and the carved tablets describe him as a great warrior and exponent of unarmed combat. Although there is reasonable evidence to suggest that Gilgamesh was quite an adept martial artist, it has not been possible to establish the extent of his mastery of these arts or any link between him and the martial arts as we know them today. The Epic of Gilgamesh does however show early development of a systematic system of unarmed self defence and adds to the mysteries of the origins of modern Karate. In order to examine that which is actually known, with any degree of certainty, about Karate as we know it today, it is necessary to move on some 3900 years from Gilgamesh and Mesopotamia to the island of Okinawa which is located in the East China Sea some 500 miles south of Japan. Okinawa is strategically placed and as such has had to suffer a succession of invasions and periods of oppression. In 1477, following a period of political turbulence, the King of Okinawa, Sho Shin, banned the carrying of weapons by any of the islands inhabitants. In 1609 the island was invaded by the Japanese who continued to enforce this ban by barring the carrying of weapons by anyone other than Samurai. As a result of this policy of disarming, the islanders developed, in secret, systems of unarmed combat which became known as “Okinawan Te” . The word “Te” meaning hands. Over the ensuing years the “Okinawan Te” developed into three distinct styles around the main Okinawan towns of Naha, Shuri and Tomari. These styles became known simply as Naha-te, Shuri-te and Tomari-te. The names of the three styles have changed over the years. Naha-te developed into Gojo-ryu (the hard and soft school) which is how it is still known today whilst Shuri-te and Tomari-te merged, in the late nineteenth century, under one name Shorin-ryu (flexible pine school). It is from Shorin-ryu that Shotokan Karate, one of the most widely practised styles today, has developed. A further style, named Shito-ryu, was also developed as is widely practised in Okinawa. Shito-ryu is a combination of the three ancient arts of Naha-te, Shuri-te and Tomari-te. In the late 19th century, the Karate Masters agreed the name Karate should be used to encompass all the styles. When translated, Karate simply means empty hand. Karate was introduced into Japan in 1915 by a man named Gichin Funakoshi (1868-1956) when he demonstrated the art at the Judo Headquarters in Tokyo. This demonstration generated a great deal of interest and Funakoshi remained in Japan to teach his art. 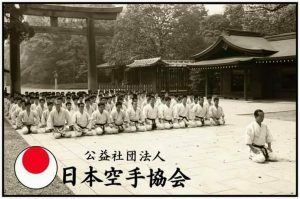 Subsequently many other Okinawan Masters followed in the footsteps of Funakoshi and in a very short space of time Karate was being practised in all corners of Japan. 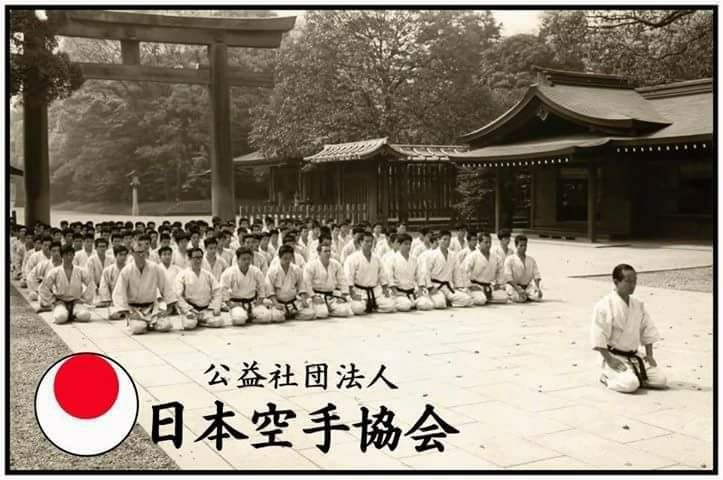 In 1936 Funakoshi established a karate training school in Tokyo. At that time, Funakoshi’s pen name was “Shoto” which when translated means “waving pines”. Funakoshi had never given his style of karate a name, so above the door of the dojo his students hung a sign which simply said SHOTO KAN…with Kan meaning “hall” or “building”, the sign told people that this was the place where Shoto teaches his karate. From then on, Shotokan became the ubiquitous name for his style of karate. Gichin Funakoshi devoted his whole life to Karate. He commenced his training in Okinawa under two great and renowned Masters, Azato and Itotsu of whom he describes great feats in his autobiography Karate-do, My Way of Life. There is significant evidence to show that the Okinawan martial arts were influenced by the early fighting arts of China. It is known that trade routes existed between Okinawa and China at the time that Okinawan Te was undergoing its development and that Diplomatic relations existed, with the exchange of Ambassadors, between the two countries. Further evidence of the Chinese influence can be found in the Karate Kata; two examples being the kata Kanku Dai and Chinte. Kanku Dai was originally named after its creator, Kushanku, who was the Chinese Military Attaché to Okinawa whilst the kata Chinte when translated means Chinese hands and is believed to have deep Chinese origins. The fighting arts of China can be traced back to the early sixth century AD and it is believed they were strongly influenced by Buddhism and in particular the teachings of an Indian Monk named Bodhidarma. The birthplace of Buddhism was in the foothills of the Himalayan mountains in northern India. Its founder was Siddhartha Gautama, born around 566 BC, who became known as the Buddha (the enlightened one). Buddhism spread quickly throughout India and was imported into China in the first century AD by Indian merchants and monks who travelled the silk routes. As far as Bodhidarma is concerned, he is known to have spent a good number of years teaching the monks of the Shaolin Monastery which is located in the Songshan mountains in the Kingdom of Wei, northern China. The Shaolin Monastery is so named because of its position within a small forest, Shoa meaning small and Lin meaning wood. As well as teaching Buddhism within the Monastery, Bodhidarma is believed to have provided the Shaolin Monks instruction in breathing and fighting skills. Although Karate, like all other things, has had to change over the years, its fundamental principles have stood the test of time. Today students of the art will practice many of the techniques as they were taught hundreds of years ago.